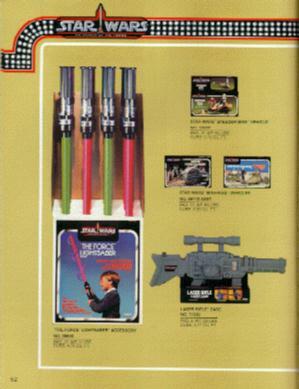 This page in the 1985 Kenner Toy Fair catalog contains a number of items that were never released in Power of the Force packaging: Lightsaber Store Display, Speeder Bike, Endor Forest Ranger, Desert Sail Skiff, and Laser Rifle Carrying Case. 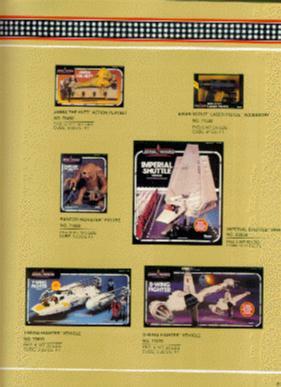 This other page in the 1985 Kenner Toy Fair catalog contains a number of items that were never released in Power of the Force packaging: Jabba Playset, Biker Scout Laser Pistol, Rancor Monster, Imperial Shuttle, Y-Wing Fighter, B-Wing Fighter. There are no known prototypes of these items in existence today, although you will notice that most of the items have simply a Power of the Force logo pasted on top of the Return of the Jedi version of the same toy. In other words, not too exciting.